Below are a few more observations about a lecture by one of the drafters of Sing to the Lord. Let me say once more that I like SttL very much, and that’s why I find this lecture so troubling. By the way, this article is part of a series. You may wish to read Part 1 before continuing. Also, I would have preferred a more irenic tone. For instance, he calls people who interpret certain conciliar statements 1 differently than he does “zealous but misinformed.” I found his comment about Helen Hull Hitchcock “encouraging disobedience” close to libel. 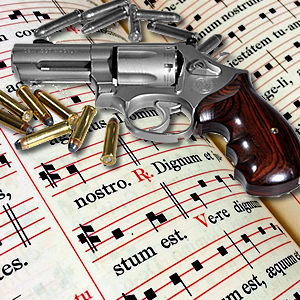 2 In general, I believe Sacred music is such a sensitive issue that inflammatory language should be avoided. Some individuals and organizations seemingly use chant as a weapon to advance their agenda and judge others. I have to be completely honest here: I have no idea what he’s talking about! In general, his lecture seems to be a subtle attack on Catholics who take certain conciliar statements seriously. This attack is justified by a alleged quest for “balance,” but actually it’s a false balance (as I mentioned earlier). The fact is, Gregorian chant is almost never sung these days. When it is, it’s usually done badly. Probably less than 0.003% of Catholic churches truly give chant “first place” (as the Council mandated). What is the purpose of Fr. Ruff’s attack, then, when less than 1% of churches have any interest in chant or polyphony? The question is not whether a particular piece sounds like chant or Palestrina or whether it sounds “Catholic.” […] STL does not assume that chant and polyphony are absolutely the highest models of sacred and Catholic music in all cultures, as if there were no need to take into account whether one is in the Midwest of the United States, or Africa, or Japan, or whether the assembly is predominantly European or Hispanic or Native American. But let’s consider his larger point: the notion that those of another culture can’t appreciate polyphony and chant in a meaningful way. I couldn’t disagree more! For one thing, the vast majority of classical musicians today are Asians. In summer music workshops I attended, more than 95% of the students were Asian. 4 Some of my best friends in the conservatory came from Thailand, China, Japan, and especially Singapore. Frankly, I find his argument absurd. After all, 98% of Caucasian Catholics have never heard polyphony or chant sung well in a Catholic church. Asians are probably more likely to have heard such things! Besides, he doesn’t tell us what to do if 1/3 of the congregation is Asian, 1/3 Native American, and 1/3 Caucasian. Nor does he explain what happens to the “ideal” if 1/4 is Native American, 1/4 Caucasian, 1/4 Filippino, and 1/4 African. The bottom line: Catholics aren’t dumb. We can learn. And I utterly reject the notion that “race” affects the ideal as presented by the Second Vatican Council. The good news is, churches honoring chant—such as Our Lady of the Atonement in San Antonio, St. John Cantius in Chicago, and so forth—tend to thrive. Many are bursting at the seams! Recently, I visited a parish which sang the polyphonic Joan Brudieu Kyrie with Mass XII, alternating with the congregation: I’ve never heard such participation! Every man, woman, and child sang with gusto! Bravo! 1 For example, Sacrosanctum Concilium §116. 2 Full disclosure: I met Mrs. Hitchcock a few years ago and have great respect for her. In fairness to Fr. Ruff, the statement directed at her may have been “tongue-in-cheek,” since his own views on many issues (e.g. the indissolubility of marriage) are well known. 3 It is true the Council called for inculturation, “especially in mission lands,” but numerous provisos are required. Perhaps I should write an article examining these provisos, since they’re frequently ignored by those with a distorted view of inculturation. Incidentally, throughout the document, Fr. Ruff promotes legal positivism, which basically says that anything “allowed” is automatically good, by virtue of the fact that it’s permitted. 4 At one of them, held near my hometown in Kansas, all instructions were repeated in Mandarin Chinese.